In my Social Media Theory & Practice class this week, we took a look at LinkedIn. Billed as the “world’s largest professional network,” I have had a LinkedIn account for the past 7 years. I established one while I still worked at MMA Creative, a Cookeville-based marketing agency. I had a LinkedIn account before I had a Facebook account, so for me, it was really my first experience with social media. So far, I have 194 connections with my profile — majority of which are work related, and I receive at least 2-3 requests for connections each week. I have been endorsed by a total of 57 people with my top skills in press releases, copywriting and email marketing. To be honest, I haven’t cultivated my LinkedIn presence beyond making and accepting connections. However, when I updated my profile in January (I was promoted from Marketing Director to Executive Director in the Office of Communications & Marketing), I was flooded with congratulations to my email from my LinkedIn connections. I gotta admit that was nice and brought this social media tool back into the forefront of my mind. To help beef up my LinkedIn presence, I joined several groups: Brand Activation: Cutting Through the Clutter, Higher Education Management and Higher Education Public Relations & Marketing Group. I also spruced up my profile, adding in education information and interests. 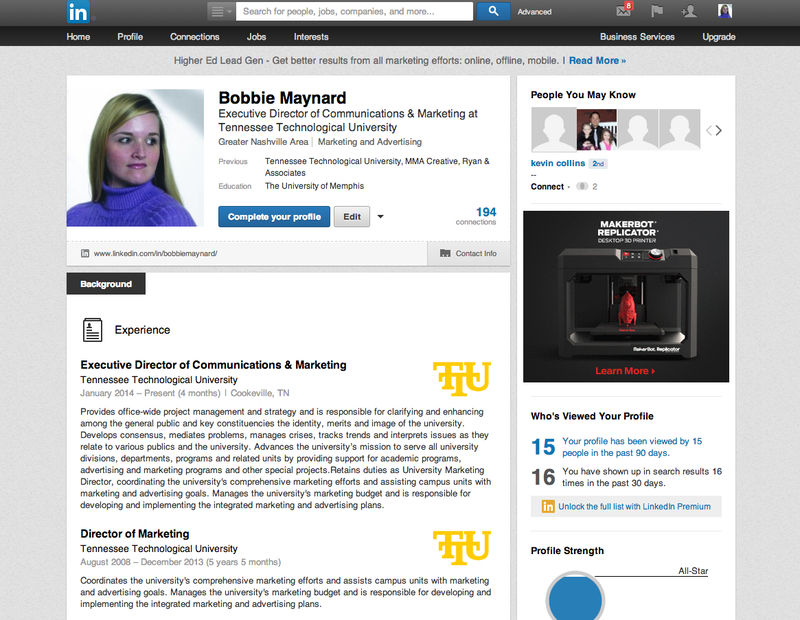 I think LinkedIn does go a long way in establishing your personal brand online. The other tool I use most often for this is Twitter. After participating in several Twitter chats, I think that it is key for getting out there, networking, being part of a conversation and making connections with peers in my industry. I could do a better job of using both Twitter and LinkedIn, especially making Twitter part of my daily routine. I just need to find the time to do it. Work is intense right now with so many projects ongoing, that professional development and furthering my personal brand has suffered, which is not good. As for an engagement strategy, I plan on using Twitter and LinkedIn to help push content out to my audience (other peers in higher ed marketing or even marketing in general). I have found Twitter to be the most effective. I really enjoyed the class discussion a few weeks ago with Elle Perry, formerly of the Beale Street Chic blog. I enjoyed what she said about networking in person in addition to networking online through social media and her blog. It’s all about putting yourself out there. In my profession, we have an opportunity once per year to visit with other university offices of communication and marketing from across the state at the annual Tennessee College Public Relations Association conference. We get to learn from other universities, both public and private, about the challenges they face, new strategies and we even have a friendly competition for our publications, news stories, marketing campaigns, etc. So, I want to be able to bring my personal brand I am cultivating more out into the open at these events, maybe taking part in a panel discussion. This entry was posted in Uncategorized by bobbiemaynard. Bookmark the permalink.